The U.S. EPA has finalized the air pollution standards known as "Boiler MACT," which applies to large and small boilers in a wide range of industrial facilities and institutions. 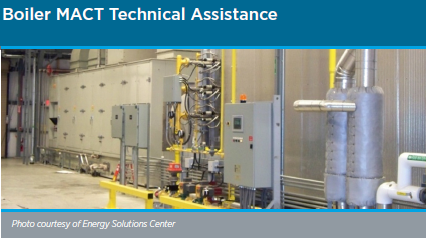 The DOE is offering technical assistance to the more than 650 affected facilities to ensure that major sources burning coal or oil have information on cost-effective clean energy strategies for compliance, including CHP, to cut harmful pollution and reduce operational costs. Oregon State University’s new Energy Center is a 6.5 MW facility that will generate nearly half of the campus’s electricity on site. It went online in June 2010 and is the first platinum-rated (highest) power facility in the nation. It will also serve as an educational center for its students. Simpson Tacoma Kraft Co., one of Washington’s oldest continuously operating pulp and paper mills, began operation of their 55 MW biomass cogeneration plant in 2009. The renewable power is sold through Iberdrola Renewables to the Sacramento Municipal Utility District (SMUD). The plant produces enough renewable energy to power 38,000 homes a year. Iberdrola Renewables is the world’s leading provider of wind power. With a shift in forest management priorities, this Oregon lumber mill was forced to downsize and focus more on high quality, low production specialty items. Seeking to dry more lumber, they needed greater boiler capacity to heat more dry kilns. This led to installation of a 1.5 MW cogeneration facility. Government incentives made the project feasible. Combined Heat and Power (CHP) is... an efficient and clean approach to generating electric power and useful thermal energy from a single fuel source at the point of use. . Every CHP application involves the recovery of otherwise-wasted thermal energy to produce cooling, heating or process thermal energy or electricity, improving energy efficiency and reducing greenhouse gas (GHG) emissions. CHP already supplies over 10% of our nation's electricity, and can and should supply more. Waste Heat Recovery is... capturing waste heat that an industrial site or combustion process is already emitting, and using it to provide useful thermal energy elsewhere in the facility or turning it into clean electricity or mechanical power. Waste heat recovery for power generation is also known as bottoming cycle CHP or waste-heat-to power. All of these are... CLEAN ENERGY APPLICATIONS - a better solution for our country's energy supply, economy, and environment. DOE Loan Programs Office offers loan guarantees to finance projects and facilities located in the US that employ innovative and advanced fossil energy technologies (" Advanced Fossil Energy Projects”) that avoid, reduce, or sequester air pollutants or anthropogenic emission of greenhouse gases.